The JVC MS55i2plus has been designed with the latest generation IPS LCD with an LED backlight, featuring a 5MP, 21.3″ grayscale panel. The 5MP MS55i2 plus now delivers a contrast ratio of 1400:1 and a maximum luminance of 2000 cd/m² — providing the brightest and clearest images ever. The brighter screen dramatically increases the number of perceptual grayscale steps to improve visibility of microcalcifications, tumors and structures. 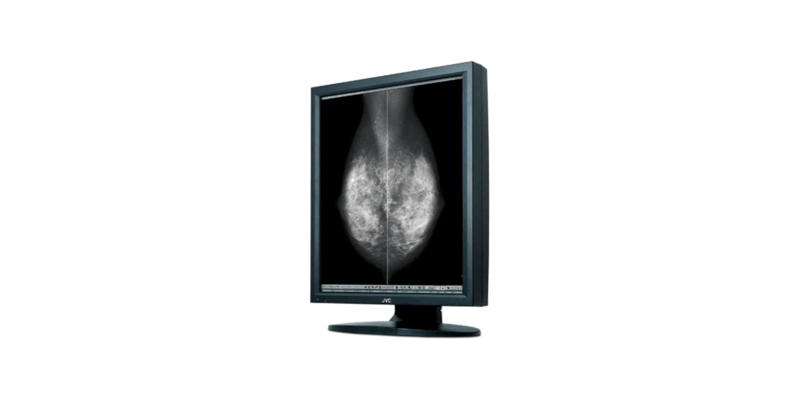 A new DICOM conformance self-test function is another feature of this newly upgraded digital mammography display. The JVC MS55i2 plus also incorporates an integrated front luminance sensor and an internal temperature sensor which collects, analyzes and stabilizes luminance, eliminating backlight fluctuation. Additionally, the backlight rise time achieves DICOM calibrated luminance levels in under a minute.